Among the findings that surprised Stephen Davis and me in our study of wills in the old South is how many wills contained trusts (either explicit or implicit)--nearly 40%. I had expected that trusts would be more a post-war phenomenon. That was in part because John Langbein has pointed out the centrality of trusts in promoting economic development in the later part of the nineteenth century. Trusts are both an engine and a sign of economic of economic growth, of course. Langbein has emphasized their role in late nineteenth century development, but their common appearance in the antebellum era points to similar stories. What interests me about the trusts is that they're being used in a place where there is fascination with all sorts of new technologies. In Greene County they are digging wells that are a couple hundred feet deep to get water (preferrably water that rises to the surface through underground pressure -- artesian wells -- rather than through pumps). In some cases the wells turned turbines that provided energy, for instance for hauling goods short distances. They used steam engines in mills that processed crops; and of course steam powered ships hauling goods and passengers up from Mobile and back down the Black Warrior River. What a strange juxtaposition of the most modern technologies with an ancient labor system. Though perhaps there's nothing inconsistent about trying to get labor as cheaply as possible and harnessing every technology that will allow the most efficient production possible. First, they're a sign of just how affluent some people are in Greene County. And as I've noted, they're used for everything from managing plantations for family members (minor children and widows) to providing income to family members. And the incidence of trusts increased over time -- in the early 1830s, not quite 30% of the wills used trusts; by the early 1840s, more than 40% used them. And a lot of the trusts provide for the operation of plantations to provide income for family members; others put property into trust for the daughters of the decedents, to be managed by their brothers. This, I suppose, is to give the daughters a beneficial interest in the property, without allowing the property to be spent by their husbands or attached by their husbands' creditors. Second, the trusts are not just indicators of the wealth; they facilitate the creation of more wealth and the maintenance of that wealth within families (or in a few instances, to freeing enslaved people through colonization). For instance, the will of Morton ordered the sale of the decedant's property and then the investment of the proceeds into slaves, who would be held in trust. This conversion of property into slaves (and in another case into stock) illustrates how some calculating testators harnessed the technology of the trust to provide for their family members. A few wills dealt with stock in Virginia companies, further evidence of the ways that the market economy was penetrating the United States and facilitating its growth and the wealth of its citizens. What these trusts show is that the planters and slaveowners of Greene County were deeply invested in the market, just like people in the north. Overall, the preponderance of trusts (and some of the subjects of the wills, like the stock left to heirs and the emphasis on management of the plantations) reinforces the picture that historians have created in recent years of the market orientation of the old South. That picture that the south and north divided over attitudes towards modernization and towards the market seem overdrawn -- in some ways they may reflect the old myth about the old south plantation as a family. The cold reality of the wills we studied shows that -- while some testators made provisions to keep enslaved people from being sold -- the plantation society was obsessed with making and preserving wealth. This won't comes as a huge surprise to people schooled in recent literature on slavery (like Annette Gordon-Reed's The Hemingses or John Majewski's Modernizing a Slavey Economy to take two books I've read recently). And it's a nice confirmation of what I've been saying about southern legal history for a long time: that we can judge ideas about the culture more generally by looking at the legal system. And while a lot of intellectual historians are interested in the thinkers who're apart from society, looking at judges' writings gives us a sense of what some of the leading and connected (as in connected to the powerful) intellectuals were thinking. Legal history--at least when we're viewing from the vantage of appellate opinions and probate records-- offers the opportunity to gauge the ideas of the wealthy and powerful, rather than those on the margins of society and those who critique it, which is so frequently the domain of intellectual historians. Next up in this series ... "How Reese Witherspoon is related to this study!" 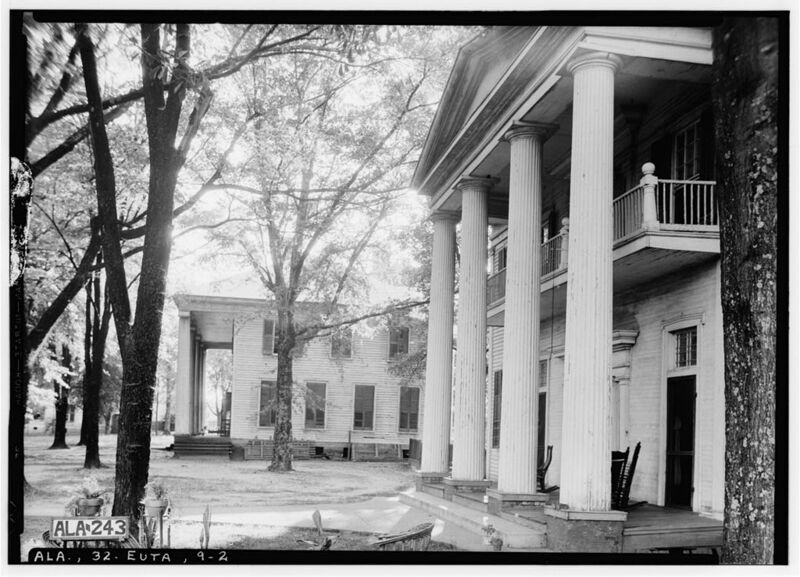 The image of the Smith House in Eutaw (which is no longer standing) is from the Library of Congress' historic buildings website. The Eutaw Female Seminary is in the background.